Inspired by 18th century French wallpaper, the Alexandre Turpault Ambroisie duvet and sham collection boasts a magnificent “Tree of Life” pattern. 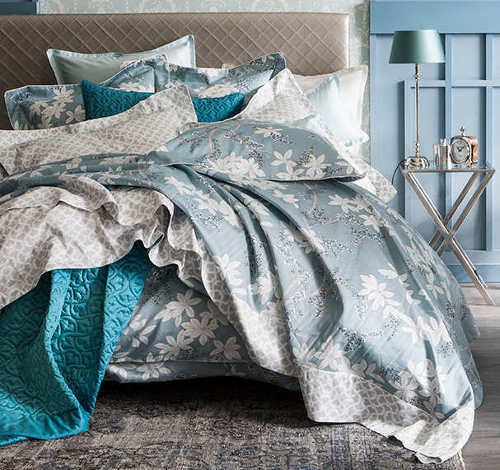 The duvet in the Celadon blue green background and fine Gingko leaves reverses to a coordinated print. Intriguing mix of patterns! Silky and soft, the Vendome duvet and coordinating Morocco decorative pillows from Lili Alessandra will wrap you in fabulous. The velvet detailing gives this bedding an elegance that is hard to resist. Shown in Taupe, but also available in Ivory and Seafoam. Did you know that DownRight has a variety of quality down and down-like comforters for every personal preference and budget? Our premium Logana 920+ Canadian white goose down is made up of the largest uniform clusters – hand selected from mature, specially bred Canadian geese – that will give you optimal warmth, minimal weight and utmost in comfort. No matter which type of fabric or thread count you choose, every DownRight fabric is synonymous with breath-ability, softness and quality. Check out our helpful down guides that will assist you in selecting the right product for your needs. 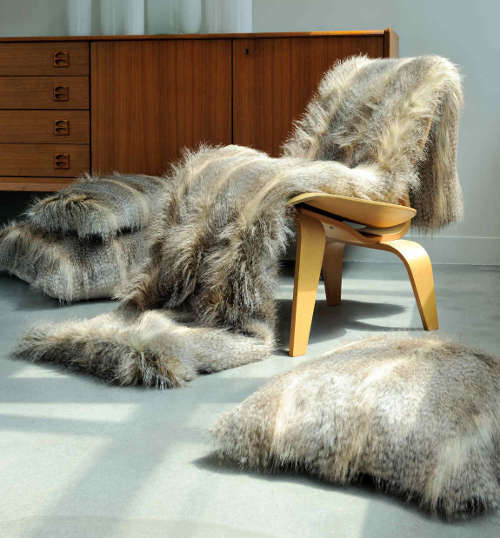 After 20 years in haute couture, Evelyne Prélonge created a line of luxuriously soft faux fur coverlets, throws, runners, and decorative pillows. To create a high density faux fur, each Evelyne Prélonge product is knitted with more thin threads per square inch than other faux furs on the market. All collections are made in France. To be honest, I had never heard of a “douillette” (pronounced doo-yet) before offering this item on our website. 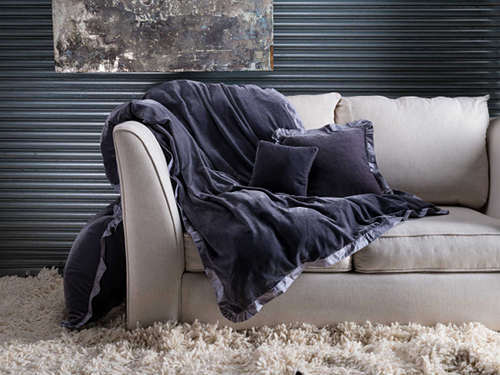 It’s French meaning – cozy, snug, comfortable – seems the perfect description for this silk velvet 53×67″ throw and decorative pillows finished with silk dupioni flange and gathered corners. Available in five colorways and includes a down filler. It may have a French name, but this douillette is handcrafted on the coast of Maine, USA. Love it! 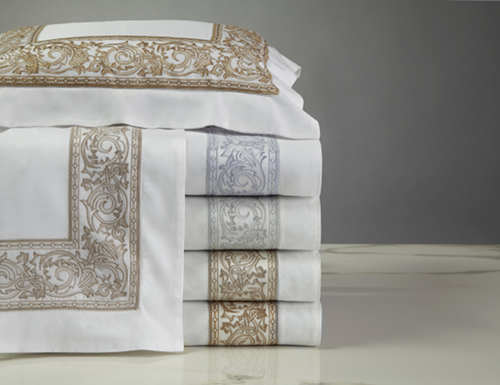 Embroidered fine linens from Home Treasures have a way setting the mood for romance. 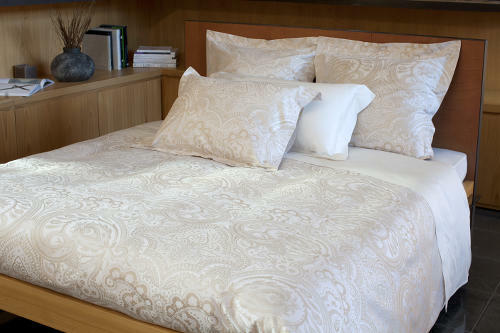 The Paris collection features an elegant embroidered border, applied to a 300 thread count, 100% Egyptian cotton, Italian sateen. Embroidered lace colors include White/Candlelight, White/Olive Gold, White/Sky Blue, Ivory/Candlelight, Ivory/Eucalipto, Ivory/Olive Gold and can be applied to your choice of body color from their Royal Sateen collection. Our bedding experts are here to help you create your vision. Visit DefiningElegance.com for more details. 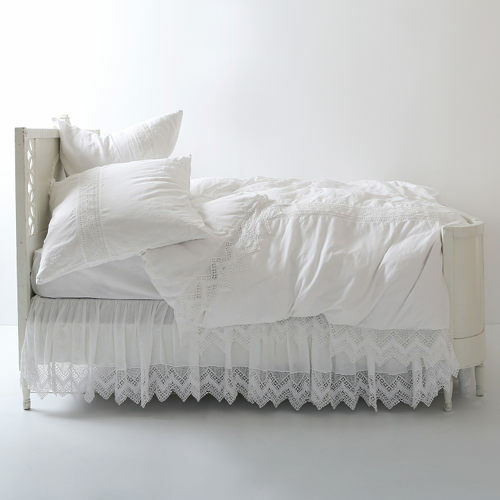 The Signoria Corte duvet and shams in 500 thread count Italian-woven Egyptian cotton creates a sophisticated look. The Corte collection is woven in a yarn-dyed jacquard paisley pattern and is offered in two colorways: White/Coffee and White/Ivory. 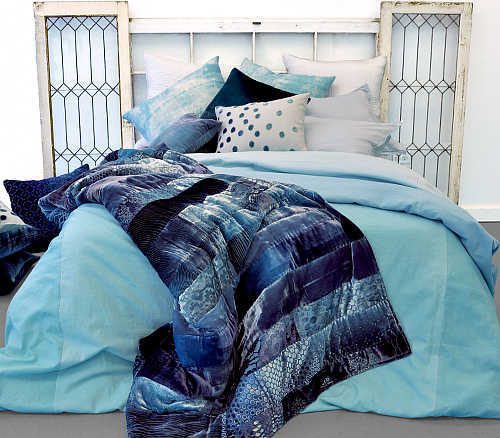 Let Kevin O’Brien’s artistic Aurora bedding create a work of art each time you make your bed. Embraced by a bevy of colors and textures, this stunning ensemble of a linen/cotton duvet, a unique collection of velvet decorative pillows, and a luscious patchwork coverlet is only one of many possibilities. We invite you view more Kevin O’Brien bedding and decorative pillow collections offered on DefiningElegance.com. A unique pairing of scroll work and embroidery, the Dena Atelier Indigo Dream bedding offers bold patterns and colors for a stunning ensemble. 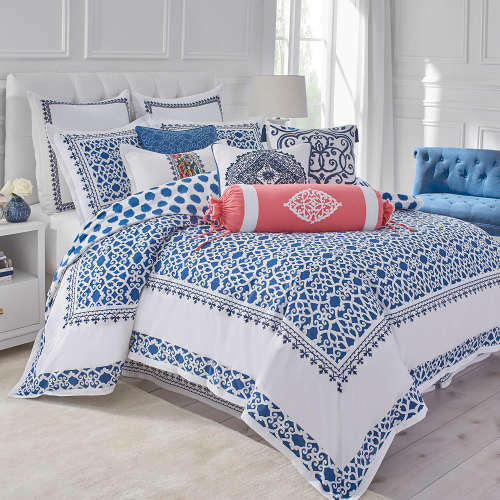 The duvet features the intricate indigo and white patterns with an Ikat reverse. Diverse decorative pillows provide interesting accents to accessorize the bed.